For the first time in its 49 year history, Jawitz Properties has launched a Billion Rand Club for agents who’ve written business in excess of R1 billion since joining Jawitz Properties. CEO Herschel Jawitz announced the inauguration of the Club at the recent Jawitz Properties Achievers Awards that took place in Johannesburg and Cape Town. 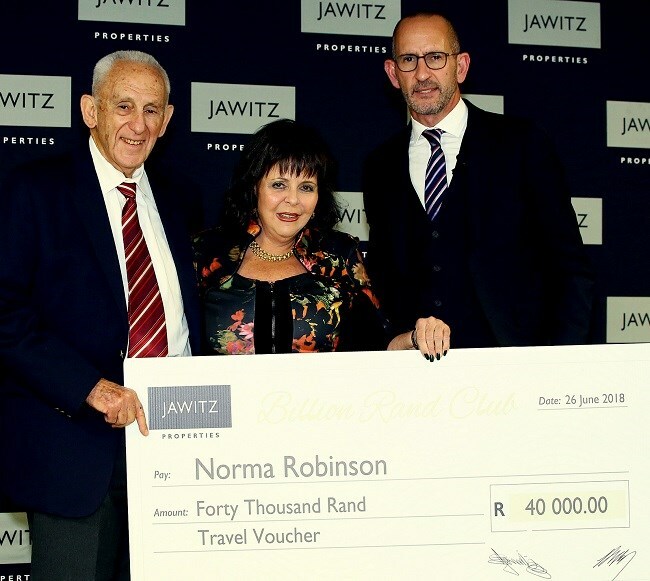 Two agents from the Johannesburg North region were named as the first members of this exclusive club - Norma Robinson from Jawitz Properties Sandton and Joan Mendelsohn from Jawitz Properties Dunkeld. Norma Robinson has been in the real estate industry for decades and joined Jawitz Properties in 2004 after meeting Eskel Jawitz, who founded the company. "Once I’d met and spoken with Eskel, I decided that with his wisdom and integrity, Jawitz would be the right company for me,” says Robinson. Writing in excess of R1 billion worth of property deals is no easy task but Robinson says she always keeps the end goal in mind and uses the skills she has to make it work. “If you can’t negotiate…RUN! This is the most important skill in a sales environment; it’s your greatest asset! Also, I would say reward yourself. Every sale makes you a hero and you deserve to enjoy the fruits of your labour. I work as hard as I can to live the life that I want to,” Robinson explains. According to Herschel Jawitz, this achievement shows the dedication of the recipients to both the industry and the Jawitz brand. “Jawitz Properties has a strong people culture and our agents hold a long affinity and loyalty to the brand. Joan and Norma are proven leaders in not only the Jawitz Property group and in the industry, but also in their communities which they’ve have served for a number of years. We talk about knowing the ‘ins and outs’ of every neighbourhood and this achievement is a strong testament to that statement,” adds Jawitz. Just Property walked away with two prestigious awards at the International Property Awards in Dubai. Pam Golding brings home a global award for their 'I am Pam' marketing campaign. Dina Soukop, CEO of Soukop Property Group, was delighted to receive a Certificate of Excellence at the 13th Annual Standard Bank’s Top Woman in Business and Government Awards.